In the past, we’ve already talked about Pixel Puzzles: Undeadz, a pretty fun puzzle game with an undead twist. Today, we’re going to talk a bit more about Pixel Puzzles 2: Birds, a brand new game in the Pixel Puzzles series. This time, no hungry zombie hordes to fend off while you’re hurrying to finish the puzzle. Now, it’s all about relaxing and … birds. There’s no story present in this game but feel free to make up your own while putting together the pieces of a bird that’s in the middle of catching a fish. The game menus look pretty simple and easy to handle. Of course, there’s only one real topic to discuss in this department: the puzzles themselves. Well, the pictures are very clear and offer some fine bird perspectives. As can be seen in the gallery, the pictures were taken by Dave Reynolds and he really did an awesome job at taking some good looking bird shots. My compliments! As a lot of the pictures have landscapes like the ocean or grasslands in it, it might prove challenging to fit those landscape pieces together as all pieces look very alike. In games like these though, that’s a huge plus as it makes the game a lot harder and the puzzles a lot more satisfying to solve. There’s not so much to say in this department of the review. In the main menus, you basically only hear birds chattering and a crab clicking his claws. In the actual game itself, there’s not really much of a difference. You hear some faint bird sounds in the background and that’s about it. Although very relaxing, the game could’ve used some music to support the puzzle element. Even some more variation in bird-like sounds would’ve made a world of difference. Gameplay wise, Pixel Puzzles 2 is pretty straightforward and easy to learn. It’s just puzzling like you would in real life at a table. You drag the pieces to the desired place and hope they fit in, that’s about it. This time around though, you’ll have to manually turn the pieces too! 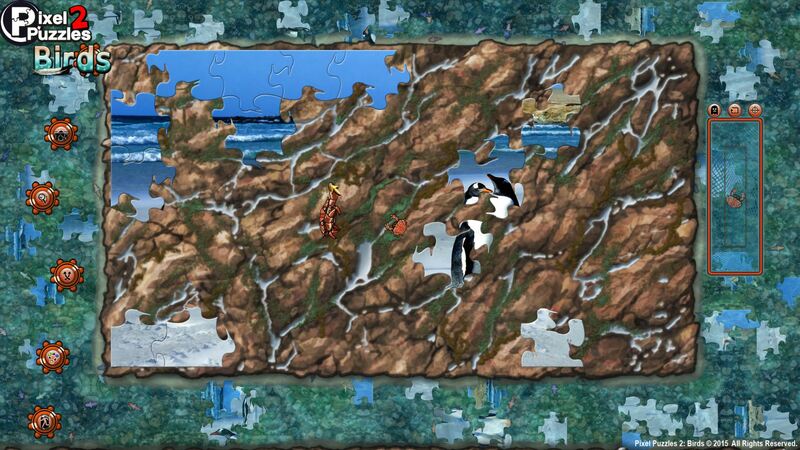 So the difficulty goes up a great deal as all pieces are randomly floating besides the puzzle panel. Although you won’t experience the same rushed gameplay as in Pixel Puzzles: Undeadz like we reviewed quite some time ago, the game becomes a lot more challenging thanks to the simple feature of being able to turn pieces around. Another layer of gameplay consists of crabs that occasionally pop up in the middle of your puzzle. You can pick them up with a single press on the mouse and drop them in a basket next to the puzzle. You might wonder: what’s the basic point of throwing these crabs in the net? Well, they function as some kind of hint system if the player gets stuck at a certain moment or he/she wants some kind of help. The more crabs you collect, the stronger/better the hint will become. 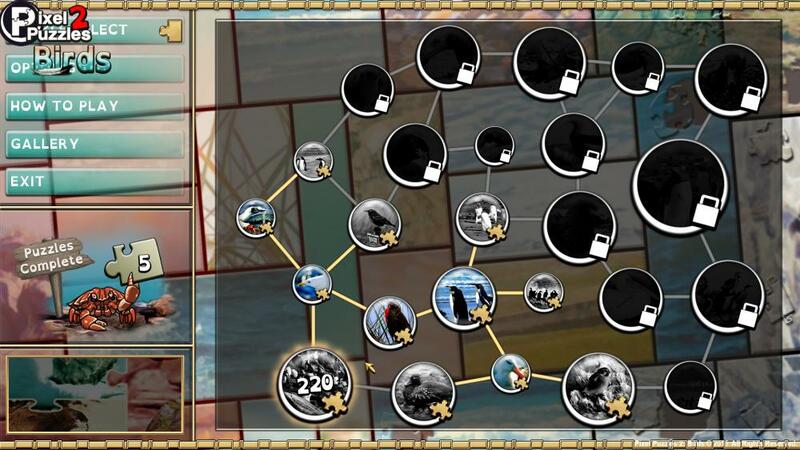 A level 1 hint consists of conjuring up a ghost image of the puzzle. Like this, players can clearly see how the puzzle is supposed to look in the end and it’s a lot easier to find fitting images like this. The ghost image only stays on for a couple of seconds before it fades away so it’s not like the ‘power up’ makes the puzzle a breeze to solve. Another hint tool helps you to find the right rotation for a particular piece on the screen. You simple select a piece and click the button and voila, you have the right rotation! This is very helpful in situations where a lot of pieces are in the same color. Lastly, the ultimate aid tool is the ‘show location’ button. As you can already conclude from the name itself, this handy button makes the game show you where a certain piece has to go. Keep in mind though, this function requires a lot of crabs before it can be used so think wisely when you best active it. 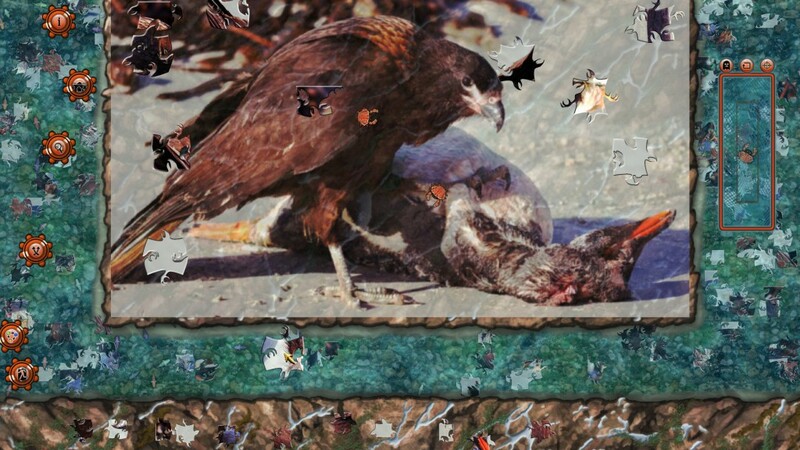 So, that’s about all you can expect gameplay wise in Pixel Puzzles 2: Birds. Although bugs weren’t really present in the game, there’re a couple of remarks. First of all, the pieces have the strange habit of clicking into place automatically, even if you’re not really close to the spot itself. Like this, you can just take a piece and try it out everywhere on the puzzle panel and hope for it to click into place by itself. The difficulty level goes way down by trying out this method so I wouldn’t really recommend doing it. Apart from that, it was kind of hard to click on the buttons on the left of the screen which make it possible to shuffle all pieces or to zoom in on the board. It happened quite often that my mouse selected a puzzle piece floating behind the button instead of actually pressing it. Pixel Puzzles 2: Birds is a fine little game to play when you have a couple of minutes of spare time left. It’s a very relaxing experience and you never get frustrated by the difficulty level as three hint tools are at your disposal to make use of. Some minor remarks consist in pieces that click into place way too easily and the fact that it’s rather hard to make use of the buttons on the left side of the screen. Overall though, Pixel Puzzles 2: Birds is a fine game to try out if you’re in a puzzle mood.